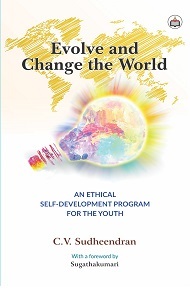 C.V. Sudheendran born at Tellicherry, Kerala in the year 1944, is an Engineer by education and profession. He has been a writer for more than twenty-five years and has published seven books in Malayalam, including Nalekkuvendi Oru Nilavili, which won a Kerala Sahitya Academy award in the year 2000. His Kuttikalude Bhagavad Gita published by Mathrubhumi Books, is a translation of selected stanzas from the Gita in verse form. It has already gone into 7 editions and has resulted in a musical CD brought out by Manorama Music. Vyaktitwa Vikasamanthrangal, a work on ethical personal growth, published by Current/DC books, has gone into seven reprints. Two of his works, Nalekkuvendi Oru Nilavili and Yukthivadiyude Daivam, were non-detailed texts for graduate classes in the Calicut and Mysore Universities.